Happy World Vegan Day! Pass it On. Send your friends a Happy World Vegan Day greeting. 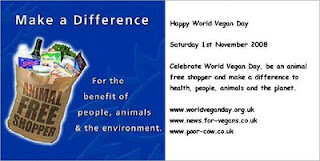 Visit www.flickr.com/groups/worldveganday choose a picture, add a picture and use delivr to send a personalised bespoke World Vegan Day E greeting card and inspire all your friends. Oasis Natural Products will be giving away 64 vegan food parcels - One for every year of veganism since 1944. Free tasters and prizes available too. Foods for Life are Challenging Pizza restaurants to create a healthier vegan version of this most unhealthy fast food. Vegan breakfast , Lunch and Dinner all for only £10 on World Vegan Day 1st November. Vegans will be celebrating their 64th Birthday at the West Midlands Vegan Festival in Wolverhampton. World Vegan Day 2008 Celebrations - Festivals, Film, Pizza and a Magazine Launch on Nov 1st. A US Survey of 3,200 adults (May 2008) suggests "The vegetarian and vegan market has the potential to grow to nearly six times its current size, which would bring the total number of such consumers to almost 18 million adults." 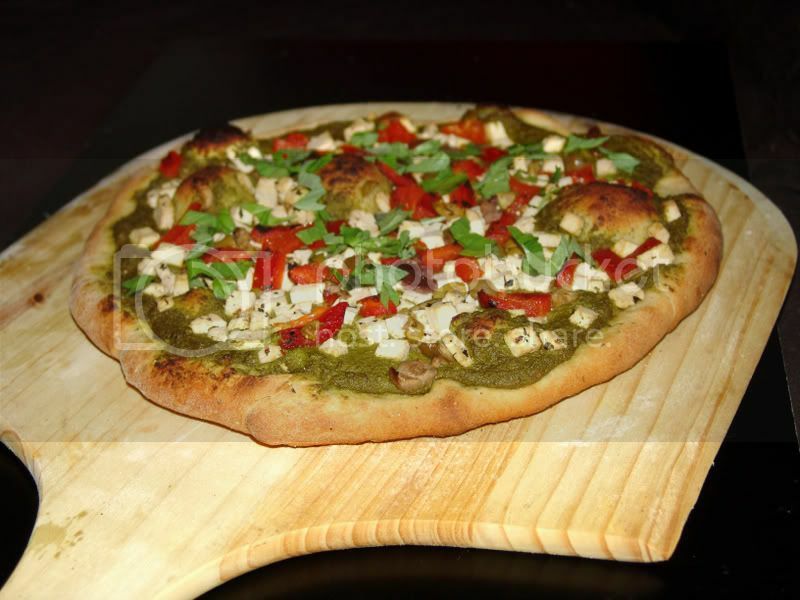 Foods for Life Nutritionists have relaunched a Healthy Vegan Pizza Campaign for World Vegan Day November 1st 2008. They have posted a recipe for a healthy Pizza with 64 ingredients to mark the Vegan Society's 64th Birthday on November the 1st. Contact High Street Pizza Restaurants to ask them to provide a Healthy Vegan Pizza choice on their menus. www.stopwar.org.uk reveals "The cost of the Iraq war to Britain is estimated to be as much as £10 billion, and the US government spends $10 billion dollars a month on the conflict. But the cost is substantially more when hidden costs are taken into account. Who pays for after care for injured soldiers? Pensions and injury payments? Joseph Stiglitz, leading economist and former head of the World Bank, has estimated that the total cost of the war to the US will be $3 trillion and $6 trillion to the world." Perhaps Sir Bob Geldof should re record his song "I don't like (black?) Mondays" ? - The catalyst for todays Wall Street crash was the growing realization that the Bush administration's $700 billion rescue plan and steps taken by other governments won't work. I'm not suggesting that the war in Iraq has bancrupted America and potentially all it's allies, I'm sure there are many other factors of Mr Bush's administration that have led to such a financial mess. I mean there's a war in Afghanistan too. The main war has been on the taxpayer a war waged by Bank executives who dished out billions of dollars of bonuses even though they had failed in their jobs and their responsibilities to shareholders. 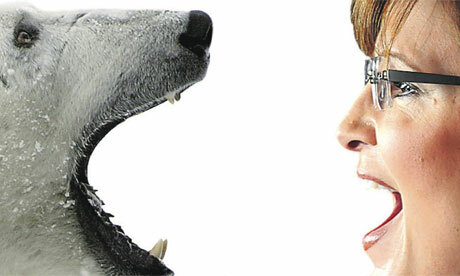 Sarah Palin v the polar bear: who will survive? | World news | The Guardian: "the right to arm bears" Ha ha ha - Well done Tim Dowling for this (and Jasmijn de Boo from Animals Count for spotting it)- loved this article! Palin: Democratic vice presidential candidate Joe Biden, feminism, belated national reality check brought on by global economic crisis. Surely the US voters are not mad enough to let this gung ho Rambo meets Nania's Ice Queen from The Lion , The Witch and the Wardrobe into the whitehouse?? Sure democracy dictates that the Oil Industry needs it's voice but look what happened when they let George Bush into the Whitehouse - Wars, skyrocketing oil prices, environmental and economic devastation, edpidemic of preventable chronic disease, a plague of GM Soya throughout South America....... Pirates in the Ivory Coast.